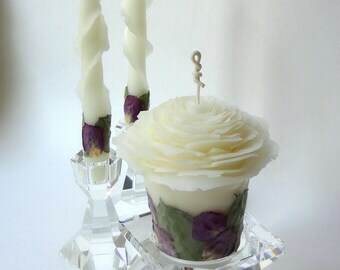 A very special candle for your happily ever after ... each candle I make is unique, no one else will have one just like yours! 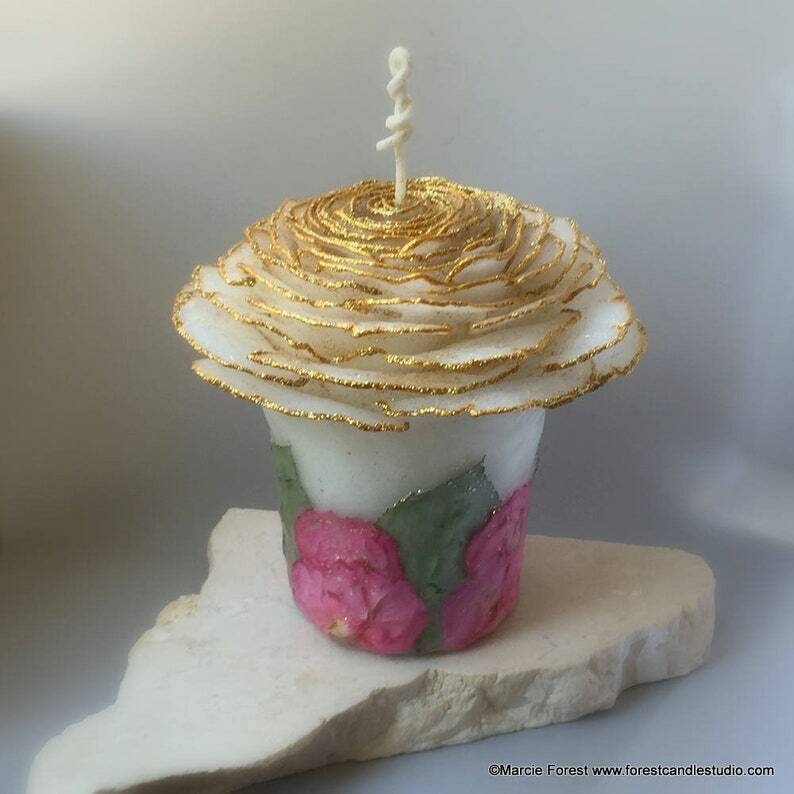 Handmade to order, this pure Beeswax Glitter Rose Candle will add an impressive touch to your wedding, home, or as a gift to someone special. 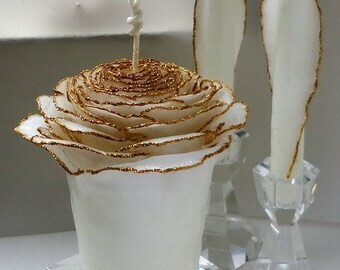 Adorned in gold or silver edging and the rose petal colors of your choice. Choose the pillar by itself and use your own tapers, or add a set of 2 matching Glitter Rose Tapers (for additional cost) from the drop-down menu. 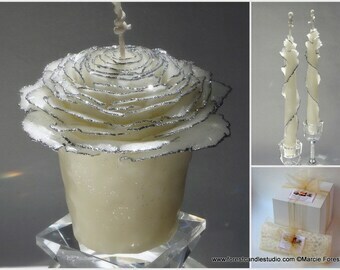 Beautifully gift-wrapped at no extra charge, the rose candle can be mailed to you or directly to your gift recipient. Other candle colors, sizes, adornments, and quantities are available in my shop or by custom order. "Absolutely gorgeous. So happy with my purchase. And Marcie is wonderful to work with. I will be a repeat customer." 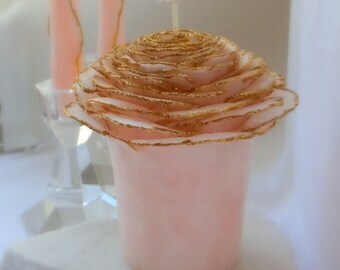 100% pure beeswax ... in my "Garden" style resembling a rose in bloom. 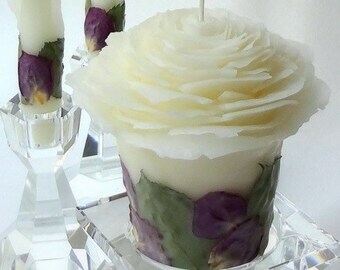 Using my original designs & techniques, I handcraft each candle to have its own unique identity. No two candles look exactly the same. Photos show examples from previous orders. 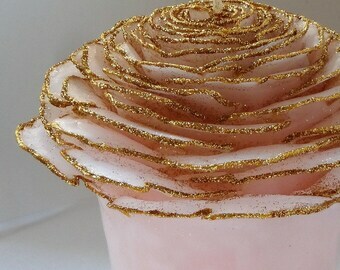 Yours will be handmade to order with the glitter edging and rose petal colors of your choice. Holders not included. 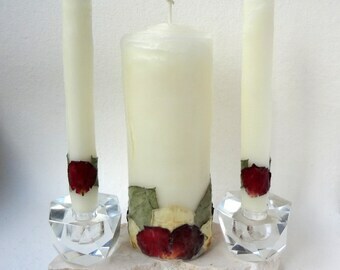 Light the Rose Pillar 2-3 hours at a time to leave the outer shell intact. If desired, once the core burns down as far as you want, reuse with votives or tea lights. Ships via USPS Priority Mail with tracking & insurance, approx 3 days delivery time but can take up to 5 days. Overnight delivery via Express Mail is an available option during checkout for an additional charge.